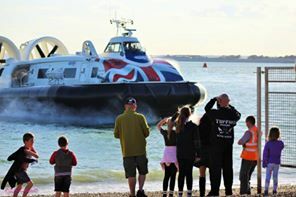 The Hovercraft Museum is proud of its partnership with Hovertravel who are for a select number of days this year, offering pleasure trips, excursions, and tours on their Hovercraft to our visitors leaving from The Hovercraft Museum. Please take a look at our events calendar to find which days this will be happening. For craft arrival/departure times please see below in the calendar. Please note that craft arrival and departure times may be subject to change on the day if operational reasons require. Pleasure flights are booked on the day on a first come first serve basis. Day trips and other excursions need to be pre-booked via the Hovertravel website. Costs for other trips and excursions can be found on the Hovertravel website here. 15 minute demo rides on one of the Hovertravel Hovercrafts! For trips to the Isle of Wight leaving Lee on the Solent Slipway and returning later on the same afternoon, or to book your travel to the Hovercraft Museum from Ryde or Southsea for ride days please visit the Hovertravel website.